The developers behind the Titanfall franchise, Respawn Entertainment, has stealthily launched a new free-to-play battle royale game titled Apex Legends. It is currently available on PC, PlayStation 4 and Xbox One and within 24 hours of the game's launch, it has managed to gain one million unique players, as per the game's Twitter account. How did we end up here? The last we heard, Respawn was busy making Jedi: Fallen Order, the Star Wars game that was announced during EA's E3 2018 Press Conference. Upon EA's acquisition of Respawn back in 2017, Titanfall 3 was rumoured to be in development. It seems that the assets meant for the latter has been converted and used for Apex Legends, as Respawn Executive Producer Drew McCoy's interview with the folks at GameInformer confirms that the game has been in development since Spring 2017. This also means a long break from some of Titanfall's most iconic features, including titans and mobility mechanics like wall-running and double jumping. Although these features appeared in prototypes of Apex Legends, none made the final cut - and with good reason, McCoy explains. For the monetisation aspect of things, there are Apex Packs which are "packs of cosmetic items or crafting currency available in Apex Legends". Respawn explicitly mentions that the packs "will never include any items that offer a gameplay advantage". In summary, all three forms of in-game currency are used to purchase Apex Packs, Legends and cosmetic upgrades. For the specific breakdown on what each currency is for, do check out the Apex Legends FAQ thread at this link. Apex Legends' YouTube channel has a couple of videos uploaded already and aside from the Launch, Gameplay and Deep Dive trailers, there are also featurettes for the characters available to players now. Respawn seems to have planned for the future, as the Deep Dive trailer mentions how there will be seasonal "Battle Passes", akin to that of Fortnite, for each quarter of this year. Something important to note is that new characters are not purchasable via these "Battle Passes". 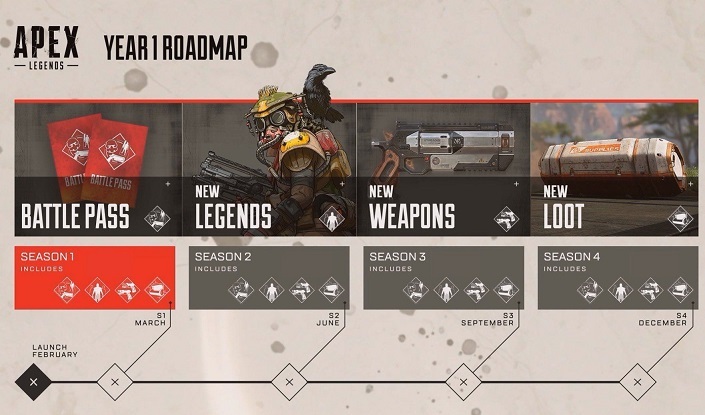 Obviously this is all quite a surprise coming from a AAA-developer like Respawn so we will be sure to keep you updated regarding Apex Legends. Be sure to share us your thoughts about the game in the comments section below! Thanks PCGamer, Eurogamer and GameInformer.